When was the last time that you saw a truly original movie? Yeah, me neither. (And I'm talking about a standard movie, not some arthouse wackiness which doesn't make any sense.) It's no exaggeration to say that there aren't many new ideas left in movies. Most any film that you watch is most likely going to remind you of another movie in some way, be it the story or the look. Having said that, filmmakers should try their best to at make their movie seem original. If you're going to rip something off, make an attempt to keep it on the downlow. This is advice that the makers of Equals should have heeded. Equals takes place in a utopian future (?) in which conformity is the law of the land. Everyone dresses the same -- although certain attire differs based on the persons job. People live in alone in small, spartan apartments where they eat, sleep, bathe, and play the occasional puzzle game. Everyone goes to work and they work together as a team. But, most importantly, no one has any emotions. Those who do show emotion are diagnosed with a diseased called Switched On Syndrome, or SOS. These individuals receive treatment for this affliction, but if it gets worse, they are encouraged to commit suicide. Silas works as an illustrator at Atmos, which appears to be like NASA. He goes about his day, content in his stoic manner. But, one night, he is overcome by an odd feeling, like a panic attack. He seeks medical attention and is diagnosed with SOS. This leads to him being shunned at work. He also begins to notice his co-worker Nia (Kristin Stewart) in a way that he hasn't before. Silas stares at her and wants to touch her. Will he be able to get these exotic feelings under control and get back to his old life? Well, you know what they say, "If you are going to steal something, steal from the best", and Equals is certainly liberal in its thievery. It takes its central premise from nearly every utopian/dystopian story ever told, as we are thrust into a world of uniformity where everyone is the same and no one questions authority. Of course, having seen these types of stories before, we are fairly certain that a character is going to rise up and challenge the system. When we drill down, we see that the thievery in Equals is actually very specific. 1997's Gattaca is set in a similar future where the main characters work at, wait for it, the space program and they find themselves entangled in a forbidden love. 2002's Equilibrium introduces us to a bleak future in which emotions have been outlawed and people take drugs to keep their feelings in check. When our hero stops taking his meds, he experiences emotions for the first time. Equals' ending is a riff on one of the most time-honored stories of all time, but I won't spoil that one for you. What does this mean? This means that from the outset, I was never completed absorbed by the story in Equals because all that I could think about was where I'd seen everything before. Even if I could have ignored that stuff, this is a difficult movie to like, mostly due to other issues with the story. I was once again pulled out of the movie when it was revealed that having emotions is referred to as "Switched On Syndrome". The only person that I've ever heard used the term "Switched On" is Austin Powers, so this was difficult to take seriously. 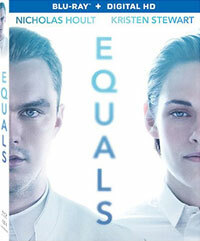 Unlike other films in this genre, where we get a very specific idea of who is in charge and what the rules are, the world of Equals is left very vague, save for the fact that emotions are bad and that citizens are impregnated by the government. I can only assume that many will read the movie as an allegory for a disease or lifestyle choice -- the way in which Silas is ostracized and avoided is very heavy-handed -- but any message gets lost in the film's other issues. Which brings me to my final problem with Equals. I've never been a fan of Kristin Stewart, mostly because I don't think that she's a very good actress. This movie did nothing to change my mind about this. Actually, she's pretty good in the scenes where she's asked to be emotionless. This seems to be right up her alley. But, I never truly believe that Silas would be attracted to Nia, as played by Stewart. Why does he like here? Is it because they go to the same barber? In the end, the only truly appealing thing about Equals is the production design. The film was shot in buildings which are all concrete and glass and truly reflect the emotionless nature of the society. If only that much thought had been given to the story. Equals is so blue that it could be a lost James Cameron film on Blu-ray Disc courtesy of Lionsgate. The film has been letterboxed at 1.85:1 and the Disc contains an AVC 1080p HD transfer which runs at an average of 36 Mbps. This transfer is a tough nut to crack, as there is clearly something wrong here. Many scenes contain very obvious blooming which creates circular waves on the screen. Much of the film looks like a low-res YouTube video. It's distracting an impossible to ignore. The scenes which don't have these odd phenomena, do appear sharp and clear, and the film's very distinct color palette come through fine. However, those odd defects (?) makes this tough to watch. The Disc contains a DTS-HD MA 5.1 audio track which runs at 48 kHz and an average of 4.0 Mbps. The track provides clear dialogue and sound effects. This is a very quiet film, and it's only in a few scenes which we get distinct stereo and surround effects. The film's score sounds very good, filling the speakers and providing some bass effects. The Equals Blu-ray Disc contains a few extras. We begin with an AUDIO COMMENTARY from Director Drake Doremus, Cinematographer John Gueserian, and Editor Jonathan Alberts. "Switched On" (8 minutes) focuses on the film's story as the creative team discuss the plot and themes of the movie. We get some nice on-set footage here. (For once, we get an extra which examines the story and it's a movie whose story was stolen from other places.) It's the cast's turn to be in the spotlight in "The Collective" (14 minutes), which focuses on the cast. We hear from Hoult and Stewart, and see Doremus working with them on-set. "Utopia" (30 minutes) focuses on the location shooting and production design, showing us the unique Japanese buildings which were used in the film.